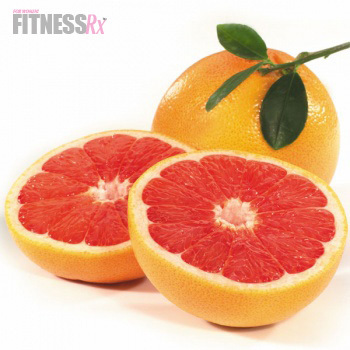 FitnessRX for Women > Nutrition > Healthy Eating Tips > Grapefruit For Fat Loss? 70's Fad Diet Returns with the Support of Science! It’s back! The popular diet of the 1970s is back— and with a vengeance. The New Grapefruit Diet has legs— and these legs can help you shed noticeable pounds. Now that it’s beach season, when we like to look good for others as well as ourselves, eating to maximize fat-burning capabilities seems to be the only way to eat. With the overweight/obese making up more than 60 percent of our population, this is a great time for Florida’s “second fiddle” of citrus to shine. A recently publicized study on the grapefruit revealed results that were both surprising and interesting. They certainly deserve our attention as another weapon in the battle to whittle down our waistlines. The Florida Department of Citrus asked Ken Fujioka, MD, of the famed Scripps Research Institute in San Diego, California (Nutrition and Metabolic Research Center), to carry out a study evaluating whether eating a grapefruit (1/2 with each meal), or drinking grapefruit juice (three servings daily), or taking grapefruit powder (capsules) would have any different effects on bodyweight or metabolic variables (e.g. blood sugar, insulin, etc.). than drinking apple juice daily. This 12-week “grapefruit diet” study enrolled 100 obese participants and asked them to maintain their daily eating habits except for the addition of one of the grapefruit variants and to slightly enhance the amount of exercise they were accustomed to doing. Thus, the only real apparent variable would be the grapefruit (or derivative). Typical weight loss for a person who is dieting would be in the range of six to 12 pounds over a three-month period. Keep in mind that in this study, the participants were not dieting. On average, those who ate a 1/2 grapefruit three times per day (as an appetizer or part of the meal) lost 3.6 pounds on average, those who drank a six-ounce serving of grapefruit juice three times per day lost 3.3 pounds and those who took the grapefruit capsules lost 2.4 pounds. In fact, the only group that did not lose weight was the group that drank apple juice! • Use the above sample menu as a guide for incorporating grapefruit into your daily nutrition plan. Eat smart, plan ahead and choose foods that you can eat as part of a lifestyle. This is your best bet for long-term success. • If you prefer, you can choose to use six ounces of grapefruit juice or a grapefruit concentrate pill with each meal instead of the 1/2 grapefruit. However, keep in mind that the group that ate the grapefruit lost the greatest amount of weight. Why Would Grapefruit Help with Weight Loss? Dr. Fujioka also found that grapefruit appears to reduce insulin levels and thus, affects blood sugar regulation. Bear in mind that your pancreas secretes insulin in response to the amount of carbohydrate ingested (also affected by the glycemic index and glycemic load of a food or meal) and that grapefruit by itself is considered by some to be low glycemic. Dr. Fujioka further stated, “For years people have talked about the grapefruit diet, and some even swear by it, but now we have data that grapefruit helps weight loss.” As grapefruit is low glycemic (because of its fiber and unique phytochemicals) and has a glycemic load value of four (less than 10 is considered low), it should be a staple in the diet. Most fruits, whole grains, vegetables, legumes, natural beans and of course, protein foods, have a low or reduced glycemic value. As stated earlier, grapefruits contain some unique phytochemicals. Among these are narginin and narginenin. These agents have also been noted to affect drug metabolism, making it important for those who take cholesterol- lowering medications, anti-HIV/AIDS medications and some other medications to learn whether eating grapefruit, drinking the juice or taking the capsules would negatively impact the manner in which the medication works in their bodies. Always ask your pharmacist or doctor about any “food-drug” interactions with any prescribed medicine. In a recent study, the effects of grapefruit intake were compared to other fruits or sugar-containing foods. The perception of sweetness and acceptability as compared to other foods was evaluated. The end result indicated that grapefruit was very well accepted and that it caused less of a change in blood sugar values than other foods with a similar sugar content. Thus, the confirmation of grapefruit as a “stabilizing” food to be included in your daily diet appears to be quite valid. According to David Katz, MD, “Eating grapefruit is a good idea; it is packed with vitamins that promote good health, and with its tangy flavor it can provide welcome relief from sugar-laden American diets.” In other words, eating a 1/2 grapefruit, drinking the juice or even taking the capsules all promote a healthier bodyweight. Since the control group (apple juice drinkers) lost on average 0.5 pounds, while the grapefruit pill group lost five times that and those who drank the juice or ate the 1/2 grapefruit three times daily lost even more weight, it seems like a no-brainer to add this food (or supplement) to your diet every meal of the day. More than likely, you’ll find yourself less hungry throughout the day, feeling more energetic, avoiding scurvy (okay, scurvy is not a problem here in the U.S.) and losing weight. When you add this phytochemical wonderland to your eating plan and couple it with smart exercise (we should all be exercising), weight loss will just happen— the research says so!